I am sitting on a rock in the middle of the dry Guadalupe River with Rust Falls in the background. You are all cordially invited to attend my photography exhibit at the Bulverde/Spring Branch Library. This is a great time for us to meet and visit in a relaxing atmosphere. It is also an excellent opportunity to support a local conservative artist. So if you live in the area of San Antonio, Austin, Boerne, New Braunfels, why not attend. 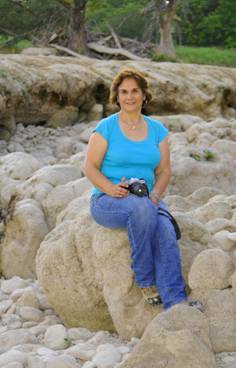 Sonja Heldt Harris, a photographer for over 25 years, is exhibiting her photography series entitled ‘Women of Comal County’ by invitation at the Bulverde/Spring Branch Library. Women who live and work in Comal County are being featured. The women selected for the series show the diversity and the talent they share while working or volunteering in their community. Heldt Harris selected this subject because she felt that the Women of Comal County are vibrant, exciting, intelligent, giving and most of all willing to enjoy life. These are also strong women who are not afraid to confront life’s many challenges. Because of the nature of the series, Heldt Harris will continue to add to her collection of ‘Women of Comal County’. The Bulverde/Spring Branch Library is located at 131 Bulverde Crossing, in Bulverde, Texas. The Opening Reception, hosted by the Friends of the Library, will be on Saturday, September 10 from 3:30 pm – to 5:30 pm. The public is invited to attend. You may go on line and see the Fotoseptiembre’s schedule of all the exciting photography shows presented mostly by women artists.